View More In Indoor String Lights - Page 3. KooPower® is a professional company specialising in KooPower branded LED Lights and consumer electronics. KooPower Waterproof This LED String Lights not only can be used in indoor only, you need so liberate your sockets, but also comes at an irresistible price. They light your home at night and look fantastic. Perfect for Christmas, weddings, party, festival, garden, kicthen and etc. Once selected, the lights will turn on in the pre-programmed timing sequence of 6 hours on, 18 hours off over each 24 hour period. Timing sequence will continue until switched off or battery power is depleted. With a low voltage transformer and LED bulbs which stay cool, you can be rest assured that these fairy lights are super safe for use around fabrics, furnishings and little fingers! 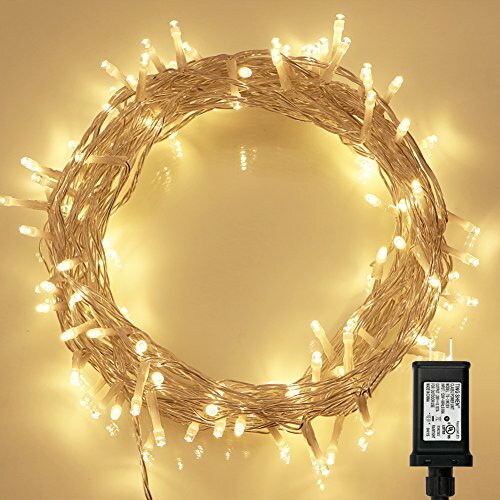 Mounted in a clear cable, these LED lights provide an elegant tone and subtle warmth to your decorations. Timing program (6 hours on, 18 hours off) provides a set-and-forget operation. The timer function will work only when you switch to 'TIMER'. Please set the mode you need before switching to 'TIMER'. Wireless Remote control allows for convenient operation. Variable mode (8 Modes) and brightness settings provide the perfect solution for your decorative lighting needs; Memory Function: Once the mode is selected, the light will work in this mode next time and you don't need to worry about re-set until switched off. Really Safe Low Voltage Transformer (Plug) for Use In Your Home. Perfect for use at Christmas, Easter, other celebration events or simply to give your home a novel warm inviting glow. If you have any questions about this product by Koopower, contact us by completing and submitting the form below. If you are looking for a specif part number, please include it with your message.